After downloading or updating the app, users will have access to exclusive opportunities to save on groceries with weekly coupons for products or discounts off total purchases. In the four days following the release of the latest version for all operating systems, there were over 900 new downloads. The coupon function led to an 80 per cent increase in downloads in two weeks with a total of 12,400 downloads since the app was launched in November 2012. About 1,600 coupons are redeemed every week and this number continues to grow. The app initially provided basic information on store locations, hours of operations and services offered. Washkosky said having these details in one place went “above and beyond anything we’ve ever been able to offer before.” And while feedback on the app was positive, he admitted its usefulness was dependent on the users’ expectations and needs. Still, there are always technical issues to resolve and content to update. Washkosky said the web applications team is working on expanding content for agro and home centres and looking at improving the design and functionality for users. “An app is never really finished. It’s an evolution. We fully acknowledge we can make things like the flyer better to improve the user experience,” Washkosky said. 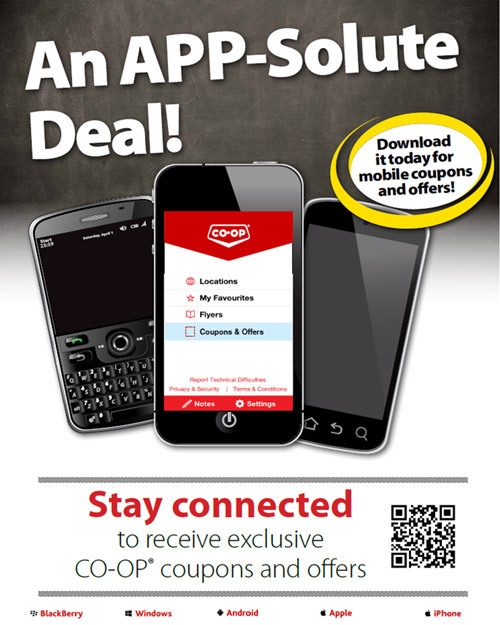 The Co-op CRS app is available on four operating systems: Apple, Android, Blackberry and Windows. The need for evolution is shown by the latest BlackBerry smartphone, which requires a whole new version of the app to be created; the coupon feature is now available, with the remaining functions to be launched this fall. Updates to Apple’s operating system may also lead to design changes in the future.